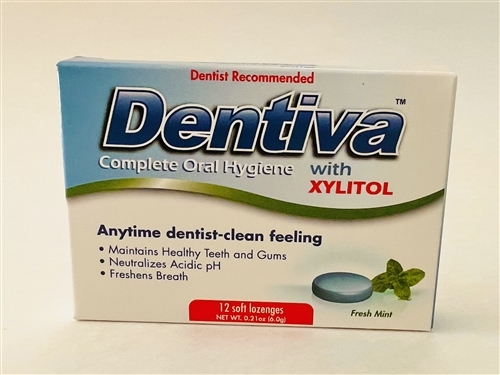 Dentiva™ lozenges deliver essential oils and other active ingredients over an extended period of time to reduce the oral bacteria, especially the halitosis causing ones. Dentiva™ produces a pleasant minty taste and fresh-mouth sensation that lasts up to several hours. Independent studies show the time-released ingredients reduce the bacterial mass, dissolve the biofilm that coats the mouth (specifically the tongue), reduces the risk of tooth decay, maintains a healthy pH balance, and traps the odor causing compounds (VSCs) responsible for bad breath. The biofilm is a filmy layer that envelopes 80% of all bacteria and protects the bacteria from the outside environment by forming a protective layer that is very difficult to penetrate. Dentiva is a breakthrough response to the growing understanding among health professionals that by controlling biomass and biofilm in the mouth the incidence of several diseases and the incidence of bad breath can be reduced. Dentiva™ lozenges are useful throughout the day for those wanting to control bad breath and provide a healthier oral environment. Dentiva™ lozenges should NOT be chewed or bitten otherwise the long lasting effect will be lost. Many patients have found the length of time for the Dentiva to melt to be as much as 4-6 hours, making it also very economical.